Board Meetings are generally held the 1st Tuesday of each month. The location of each meeting may vary so check back here for the location of our monthly meeting. All members of the Milford Youth Football & Cheer community are encouraged to attend. 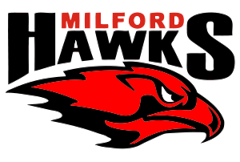 Attendance at a Board Meeting is a great way to stay up to date with what is going on with Milford Youth Football & Cheer and can also serve as a forum for any questions you may have. For specific information regarding our Board Meetings please visit the Board Meeting article in the About Us section of this website where you will find past meeting minutes and current agenda items. Thank you Shaws Milford for your generous donation and taking the time to present to our 6th Grade Milford Hawks! Milford Permanent Firefighters Association Local 2140. 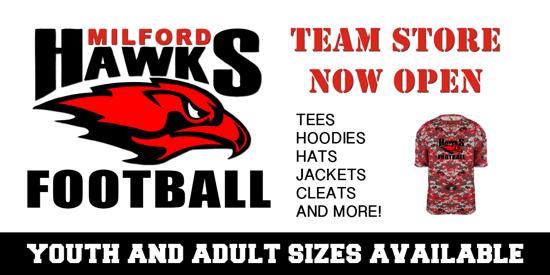 ©2019 Milford Youth Football and Cheerleading / SportsEngine. All Rights Reserved.